It's actually made of Legos, to full scale, with an actual cockpit. Say what you will about the styling of the McLaren Senna, but it makes an unusually accurate transition to Lego form. That much we found out when the Anglo-Danish collaboration released the six-inch-long toy version a couple of months ago. But this... this is something else entirely. And it's far more impressive a feat. This Senna was built, to full scale, using nearly half a million (or roughly a metic ton's worth of) individual Lego bricks. And the result, at least when viewed from a step back, looks like a spitting image of the real thing. The project was completed in secret by 42 skilled assemblers working in shifts around the clock. 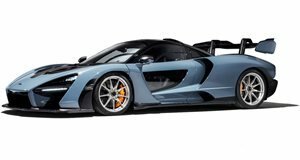 All told, it took some 2,725 man hours to complete, which is nine times as much as it would take to build an actual McLaren Senna (as intricate a process as that must be already). And it took nearly as long to design it as it did to put it together, using 467,854 bricks – almost double the number they used to build the full-size 720S two yeas ago. And it weighs a hefty 3,750 pounds – a good 1,100 more than the actual car. The finished product even has a working cockpit (of sorts) that you can actually climb into. The butterfly doors were reconstructed from Lego bricks (and can to be unsnapped to access the cockpit). Inside it incorporates the actual carbon-fiber driver's seat, steering wheel, and pedals (mounted on the "right" side) from the real car. You can even push the "stater button” and hear the recorded sound of the engine come to life. The badges, wheels, and tires are also lifted off the real thing, and the full-scale model is set to go on tour to special events around the world.